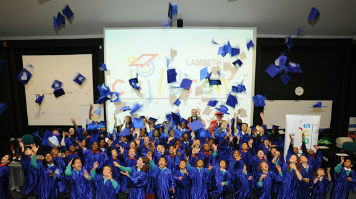 Pupils and students from Lambeth Children's University this week donned robes and mortarboards for their very own graduation ceremony at LSBU. The Children's University aims to reward young people for the time they spend in out-of-hours learning activities, and provides them with certificates and awards to mark their participation. The programme develops a culture of achievement and lifelong learning from an early age, increasing motivation and helping to support the transition between primary and secondary education. The event saw students aged 7-14, from schools across Lambeth, receive praise for their achievements. Over the past few months, they have been gathering credits for their learning hours- those who have successfully completed 30, 65 and 100 hours of extra-curricular activities will be rewarded with Bronze, Silver and Gold Certificates in the formal graduation ceremony respectively. The students received a taste of the University's academic traditions, including wearing robes and mortarboards, as well as having photographs taken as a permanent reminder of their big day. Simone van Limbeek, a pupil at Crown Lane School and Children's University student, says "The Children's University has been a great way for me to visit new places and learn about lots of new things in my own time, and it's been really fun." The students were joined by Councillor Mark Bennett, Mayor of Lambeth, children's author Vicki Howie, and Ger Graus, Chief Executive of the Children's University. Certificates were presented by Bev Jullien, Pro Vice Chancellor at LSBU, and Chancellor of Lambeth Children's University. "I am honoured to show my support to the Children's University", Bev Jullien says. "The enthusiasm and hard work shown by the young people who have taken part is an inspiration to us all at London South Bank University, and the programme shows that higher education is an attainable dream for people of all backgrounds. We hope to see many of the faces we saw this week studying with us in the years to come!"